Since I’ve been having a tough time being motivated and finding inspiration to write posts, I figured why not go with something simple and obvious, a movie. I was watching Bells are Ringing earlier, and voila, here we are. Released in 1960, it stars Dean Martin and Judy Holliday, along with a fantastic supporting cast. It is based on the Broadway musical of the same name from 1956, which also featured Judy Holliday playing the main role of Ella. There it is, in all its glory. And that may or may not be me. Growing up our TV was also a piece of furniture. When I was in the first grade my Dad (always the lucky guy) won money off of the radio and purchased a new TV. It was big, and encased in wood. As I said, it was a piece of furniture, we had things on display sitting on top of it. That thing lasted forever. I don’t know how many times it was affected by lightning and had to be taken to the repair shop, but each time it returned back to my parents’ house working like new. That is, until a few years ago, when lightning finally won the battle with it. Rest in peace, large wooden TV. To my surprise, my parents bought a snazzy HD flat screen TV. They’re more up on technology than I am! Vintage radios have always had a charm and appeal about them that I have a difficult time expressing in words. It’s probably better illustrated through the starry-eyed look I give while running my hand over them. There’s something about the design of them. The grip you get on the knobs. The way the dial glides over the numbers with the buzz and static interchanging with the brief sound of a station coming in tune. If anything gives the deep nostalgic feel, it’s the look, feel, and sound of a vintage radio. But you may never forgive me for the terrible title pun. Since there are many holidays this time of the year (29 from November through most of January for various major religions! ), I’d like to say, whatever you celebrate (even if it’s just Festivus) I hope your holiday and season is filled with love, good people, good times, and peace. Now I will breach a subject that may be touchy, I hope we can have a respectful and mature discussion about it . . . In 1950, “To Think You’ve Chosen Me” was written by Bennie Benjamin and George Weiss. The lyrics send a wave of glowing warmth over me when I listen. From sending “those shivers through my fingertips” to “and haunts me darling even while you’re gone,” it speaks as a love lullaby. It is soothing and comforting in its music and lyrics. It creates a space where anything seems possible, where true love exists and may just conquer all. “La Vie En Rose” was written in 1945 by Edith Piaf, Louis Guglielmi, and Marguerite Monnot. First, I’ll start off by saying that though I don’t know French, Edit Piaf’s singing gets me. . .right. . .there. While she had a tumultuous life, she could use every experience and emotion she lived through to inject into her music, lyrics wise and vocally. When she sings, you feel it, whether you know the exact words she is singing or not. She wrote the lyrics to some brilliant songs, “La Vie En Rose” being one of the best. And while I can only go off of the translated version, I can’t really offer a more beautiful and enchanting song about love. “Long Ago and Far Away,” written in 1944 by Jerome Kern and Ira Gershwin for the movie Cover Girl, is a beautiful and evocative song. Performed in the movie, which in itself is sublime, by Gene Kelly and Rita Hayworth (dubbed by Martha Mears), it invokes such sweet longing finally realized. Even if it’s not Rita Hayworth actually singing it, the sight of she and Gene Kelly on screen together during this song is an enchantment the viewer doesn’t want to miss. “Time After Time” was written in 1947 by Sammy Cahn and Jule Styne, and introduced in the movie It Happened in Brooklyn by Frank Sinatra and later, Kathryn Grayson. Oh, this song! I don’t think I can even do it the justice it deserves, but I will give it a tolerable attempt. Listening to this song, and letting it engulf me, brings the feeling as if I could crumble and be swept away on the wind. It’s the ultimate in piercing straight to my unapologetic, sentimentally plagued soul. 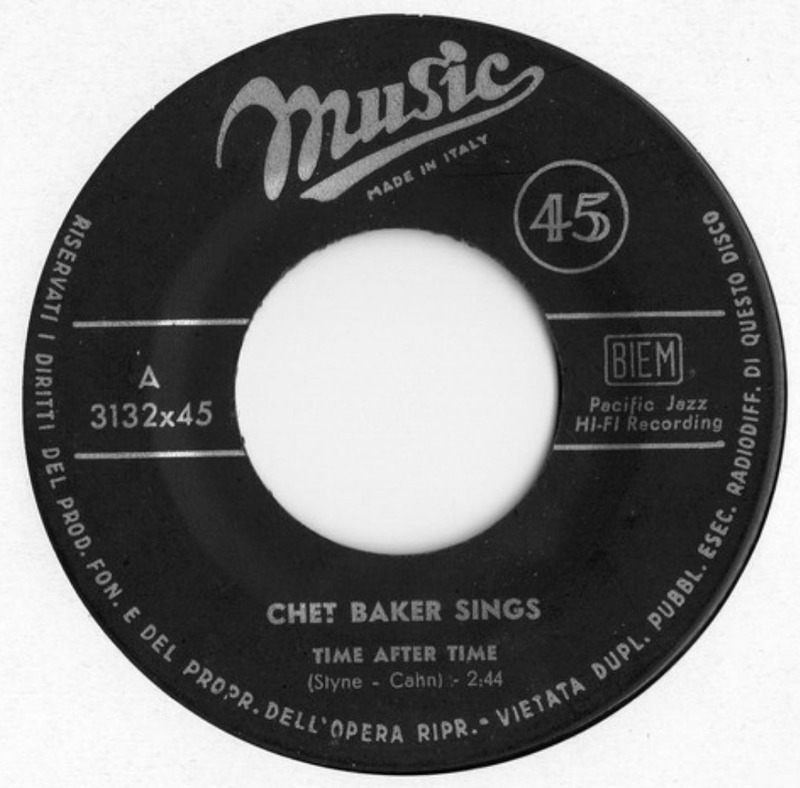 In 1956, Chet Baker recorded a version that intensifies this already divine song. It is soft, warm, and lingering, with so much coming from the heart. His vocals glide along with the music, to craft an unmistakable, not only sound, but impression upon the heart. It’s incredibly easy to lose oneself and entwine oneself with the music and the quality it possesses.